More than 10 years ago, at a conference in Jacksonville, Florida, 200 volunteer managers gathered to discuss future trends in their profession. A leader in the profession asked for those who were 22 years old or younger to stand. Less than a dozen people stood. She then informed the rest of us that in dealing with the newest generation of volunteers, we were all speaking in a foreign language; and that in order for our programs to grow and thrive, we would have to learn the younger generation's native language of technology. Only a year before, I had listened to a colleague, Jenny Greber of Newport Aquarium, roll out her newest form of volunteer training: online training courses. With a volunteer, she had developed a starting point for her volunteers' learning continuum that could be utilized by computer, at any place and time. 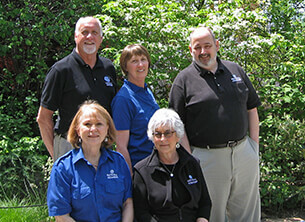 The National Aquarium IMLS Committee. After exploring various avenues of e-learning, which included subcontracting learning platforms from local universities, my co-manager, Leslie Landsman, and I received a substantial grant from the Institute of Museum and Library Sciences (IMLS). In three years, we were to develop programs to address volunteer diversity, including the growing numbers of millennial volunteers, from students to young adults. Certainly, e-learning was at the top of my project list, but not as a "stand alone" alternative to volunteer training. Instead, these online learning modules were to be developed as part of a "blended learning" approach to training, using them to complement the best parts of our existing training: the training manual, gallery tours, live presentations by in-house professionals, small group work, peer mentoring, and hands-on training. I formed a committee that included Leslie, as well as three longtime volunteers: two retired science and special education teachers (one with an advanced degree in curriculum design), Susan Christenbury and Geri Schlenoff; and an IT professional, Dan Higgins. After several false starts, I was invited by our IT director to a meeting to discuss an e-learning development possibility with a representative from CypherWorx—which, in partnership with San Diego Zoo Global, created an online learning platform: San Diego Zoo Global Academy. Their newest approach, Do-It-Yourself (DIY) courses, was extremely attractive to us, considering the caliber of talent I had already enlisted from our ranks. Our initial committee meeting was to determine how many and what courses we were to develop. We chose four general subjects—Bony Fish, Cartilaginous Fish, Invertebrates, and Coral Reefs—as well as two that were specific to the National Aquarium: our two immersion exhibits, the Amazon Flooded Forest/Tropical Rain Forest, and Australia's Northern Territory. Our last academic module was to cover our regional treasure, the Chesapeake Bay. We agreed that all modules were to have built-in conservation messages. Since we wanted to create modules that would not duplicate our training manual, I contracted our two teachers to research and write the text for the seven courses, with Susan also hired to create PowerPoint slides—the format that CypherWorx used in uploading the DIY course to the learning platform. The entire committee was tasked with gathering images for each lesson. Upon completion of the PowerPoint drafts, we submitted them to our husbandry professionals to vet for accuracy. A slide entitled "Learning Outcomes" was added to the beginning of each unit, outlining to the volunteers what they were expected to take away from the course. A 20-question quiz with selective-response answers was added to the end of each learning module. The most time-consuming aspect of the process was at hand: editing each slide, re-editing, and editing again for content, order, structure and grammar. 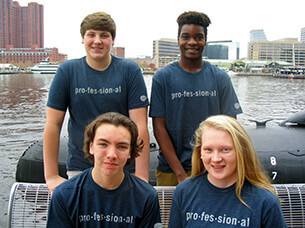 High school students at the National Aquarium show off their Academy T-shirts. Once the first three units were submitted to CypherWorx, they were uploaded to our branded San Diego Zoo Global Academy platform, Volunteer Connection. I selected a test group of 70 adult volunteers, new and veteran, to work through the units for their insights, suggestions, and comments. On a scale of 1 to 4, they rated the content (averaging 3.65), ease of access (3.25), and the final quiz (3.4), with volunteers commenting with statements such as "It's about time!" and "Welcome to the 21st century." As expected, some older volunteers with little experience taking online courses had problems maneuvering through the site. Our next test group of 70 high school students was assigned the Invertebrates unit, supplementing their training information for our newest exhibit to open: Living Seashores. As expected, all students completed their assignment without a hitch, or any questions. Leslie and I have now incorporated all of our learning modules into a blended training curriculum for all new volunteers: exhibit guides, student guides, divers, and husbandry volunteers. Access to Volunteer Connection has been given to our team of over 600 regular volunteers, as well—to reinforce their knowledge base, and have handy as a valuable reference. With this group, acceptance of that learning concept has been slow, but steady. During the development process for these learning modules, I received a webinar invitation from Tammy Rach, San Diego Zoo Global's volunteer manager, to learn more about practical applications of the Volunteer Connection platform. The webinar described how this platform could be used effectively as an online volunteer destination for printed training resources, continuing education materials, volunteer communications, event scheduling, and online discussion forums. Many of these resources could be made available to our general volunteer population, while other volunteer position-specific resources could have restricted access to certain teams of volunteers. Each week, a special volunteer comes into our office to download our Volunteer Connection online learning module reports and post the appropriate training hours to our database records. She has started to upload general information, such as manuals and briefings, while setting the parameters needed to identify position-specific teams of volunteers and their appropriate resources. Over the past three years, this has all been a huge effort, requiring many hours of paid staff and volunteer time; but it is an exciting time, as well. We are experiencing the satisfaction of a job well done—and thanks to the guidance of and professional partnerships with San Diego Zoo Global Academy and CypherWorx, we are achieving some fluency in speaking the native language of our youngest volunteers. The Assiniboine Park Zoo in Winnipeg, Manitoba, Canada is now part of the Academy's collaborative learning environment. Welcome! Keeping up with current, relevant news helps us make our organizations stronger and make our professional lives more productive. Information opens windows to ideas, solutions, projects, leads, and collaborations. But let's be realistic: who has extra time to spend searching news outlets? What we really need is a single, pre-filtered source of the latest news about the world of zoos, aquariums, botanical gardens, and conservation organizations, delivered each week to our inboxes. You're in luck! 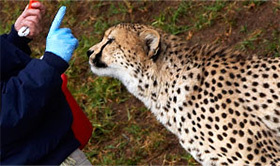 At San Diego Zoo Global, we believe that helping our staff keep on top of pertinent news supports our mission to save species worldwide by uniting our expertise in animal care and conservation science with our dedication to inspiring passion for nature. 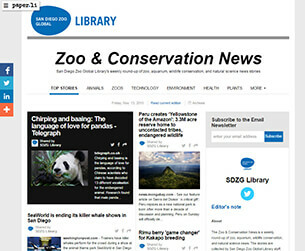 The San Diego Zoo Global Library meets this need with the Zoo & Conservation News, a weekly roundup of zoo, aquarium, wildlife conservation, and natural science news. The stories are selected by library staff from a vetted list of reputable online publishers and aggregators. Each news item is displayed with a headline, photo, source, and short excerpt. Headlines are linked to the full articles. Social media buttons make it easy to share individual articles or the entire newsletter via Twitter, Facebook, or email. The newsletter's home page features our librarians' picks for the "Top Stories" of the week. A navigation bar takes you to additional articles in eight categories: Zoos (zoos, aquariums, botanical gardens, conservation organizations); Animals (animal biology, conservation, trafficking); Plants (plant biology, conservation, trafficking; fungi; microbes); Ecology/Environment (ecosystems, biodiversity, habitat conservation, sustainability); Health/Welfare (animal health and welfare in zoos and in the wild; enrichment; zoonotic diseases); Technology (technologies used for conservation, research, and education; bio-inspired design); #SanDiegoZoo (San Diego Zoo Global news); and #EndExtinction (news about critically endangered species and worldwide efforts to save them). The newsletter is available to anyone, and subscribing by email is easy! Just enter your email in the "Subscribe to the Email Newsletter" box at the top of each Zoo & Conservation News home page. Subscribers receive an email with the "Top Stories" page and a link to the full online newsletter the instant each new issue is published (typically every Friday). We hope you try out this one-stop resource for current, relevant news. 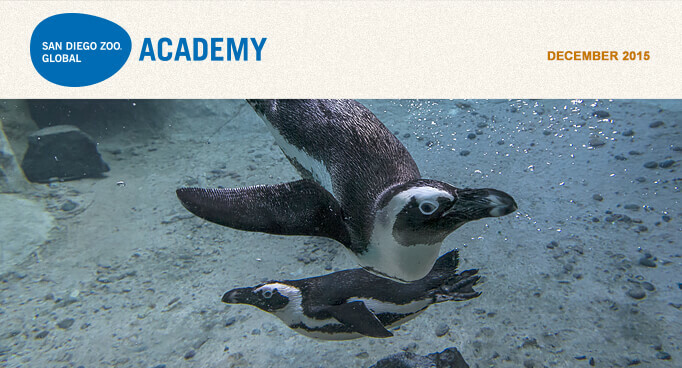 San Diego Zoo Global Academy includes a link to the latest issue in each of our newsletters. We have found it to be a rich source of useful ideas and stimulating discussions, informing our work and supporting our organization. Recently, Academy partner CypherWorx released new upgrades to the do-it-yourself (DIY) tool. The DIY Custom Course Creation Tool allows organizations to create custom courses with their own specific content. They can upload a PowerPoint or PDF, convert it into a course, and add it straight into the Learning Management System (LMS) catalog on their Academy site. New robust analysis tool, giving in-depth analytics on what topics learners are having trouble with. If you are interested in learning more about the DIY Custom Course Creation Tool, please contact Chris Glenn, cglenn@cypherworx.com. Also, you can learn more about the DIY tool at the December Administrator's Users Group Webinar. Please join us for the Administrator's Users Group Webinar hosted by Academy partner CypherWorx. The next webinar is Wednesday, December 16 at 11 a.m. PDT. After registering, you will receive a confirmation email containing information about joining the webinar. I would love to be considered a true champion of animal welfare, continuously improving and enhancing animal welfare, and the central importance of animal welfare in the future sustainability of the zoological world (and the conservation of wildlife). In conjunction with this mission, I am privileged to share ideas, thoughts and words to advance the cause of animal welfare. The Excellence Beyond Compliance® approach and book set out countless ways and opportunities to creatively leverage the Animal Welfare Act (AWA) to enhance animal welfare. Many of these best practices depend upon the assistance and expertise of other professionals who are more knowledgeable about animals and their well-being. As a "collaborating partner" with the Academy—apparently because of my unique experience, perspective and contributions (at least that is my hope)—I have been most fortunate to continuously improve my work, because of the assistance and expertise of a number of outstanding professionals with the Academy and its collaborators, participants and subscribers. The clearance and review of these columns always leaves me and my work looking better and, better yet, more effective and lasting in the real world. Conversations with the Academy's Jon Prange and Gary Priest always conclude with a rich harvest of ideas and opportunities, and a recent discussion with esteemed San Diego Zoo Global Curator Carmi Penny continues to inspire me to this day. The Academy's new Animal Welfare course, available at no cost here, is one of the best and most important resources now available to the zoological world. Indeed, taking this course, reading my book, and applying both of them daily may hold the key to the future of the zoological world. Most importantly, this could make all the difference in the world to the animals entrusted to our care. And it is the very care of—and our caring for and about—animals that brings us together here and elsewhere. Excellence Beyond Compliance and the Animal Welfare course each build upon the Association of Zoos and Aquariums' definition of animal welfare, which provides: "Animal Welfare refers to an animal's collective physical, mental, and emotional states over a period of time, and is measured on a continuum from good to poor." Explanation: An animal typically experiences good welfare when healthy, comfortable, well nourished, safe, able to develop and express species-typical relationships, behaviors, and cognitive abilities, and not suffering from unpleasant states such as pain, fear, or distress. Because physical, mental, and emotional states may be dependent on one another and can vary from day to day, it is important to consider these states in combination with one another over time to provide an assessment of an animal's overall welfare status. The book and the course also discuss the AWA and its role, which interestingly requires in part, in the "general handling regulation" at 9 C.F.R. § 2.131(d)(1): "Animals shall be exhibited only for periods of time and under conditions consistent with their good health and well-being." (Emphasis added). Significantly, in their own distinct ways, the book and the course go much further in the name of animal welfare. The book provides immediate, short- and long-range measures for constructively using the AWA to continuously improve, enhance animal welfare, and tap the passion and professionalism of everyone within a zoological organization and others from outside. The course provides historical, legal, and even philosophical context for animal welfare today, and an extremely well organized and thought-out presentation of evidence and science-based animal welfare measures, including inputs and outputs. As such, the course is an indispensable resource for the animal welfare-related training, research, planning (for example, animal welfare and species welfare enhancement plans) and improvements noted in the book, which itself is a mechanism for putting the course to greater use right now. 1. Opportunity for a well-balanced diet: fresh water and a suitable, species-specific diet will be provided in a way that ensures full health and vigor, both behaviorally and physically. 2. Opportunity to self-maintain: an appropriate environment including shelter and species-specific substrates that encourage opportunities to self-maintain. 3. Opportunity for optimal health: rapid diagnosis and treatment of injury or disease, while providing supportive environments that increase the likelihood of healthy individuals. 4. Opportunity to express species-specific behavior: quality spaces and appropriate social groupings will be provided that encourage species-specific behaviors at natural frequencies and of appropriate diversity, while meeting social and developmental needs. 5. Opportunities for choice and control: providing conditions in which animals can exercise control and make choices to avoid suffering and distress, and make behavior meaningful. (Vicino, G.A. and Miller, L.J. In Prep. From prevention of cruelty to optimizing welfare). Vicino and Miller are experts in animal welfare and true champions of animal welfare, as well. Breezing through this column, reading a little guidebook, taking a short course, and integrating all of it into practice provides an abundance of opportunities for continuously improving ourselves and our service on behalf of animals. Opportunities abound. Helpful Hints section will return in 2016!